I still don't feel like Curry, so I thought I'd share with you this salmon recipe and give you a glimpse into kind of what it's like when I cook. "Hey Peter, would you like to make the Salmon?" "Oh, umm, yeah...sure, I guess so." My mind starts turning. I happen to look at the cherry sampler platter we had received as a gift from some friends. In it was a jar of cherry vinaigrette. "Ooooh", I think to myself, "that would pair great with salmon". I share my idea with Mom...she's not so sure. I also notice a half of leek Mom had out, and hope she doesn't use it so I can. I consult my books to help me get into the mood and to get an idea as to how I'll cook the fish. I land on a Salmon braised with mushrooms recipe. "Oh, but we don't have mushrooms...they wouldn't be good with the cherry anyway," I think to myself, "I'll braise it with something else, then pour some of the vinaigrette over it when it's done". My stomach rumbles. I end up using the leek (plus another one I found), some sliced celery stalks, and some sliced carrots I stole from a dish Mom was preparing. These will add great flavor to the dish as it cooks, but will be discarded at the end. I cook them with some olive oil in a skillet for a while and add some salt, pepper, and bay leaf. I then add some chicken broth and a splash of Chardonnay, then the salted salmon "roast" (the whole fish without the head and tail), which we had cut in half. The fish sticks up too much in the pan, so I make a makeshift lid with some tin foil. The heat stays relatively low to cook the fish gently. There's something that's missing...Herbs! On my way to the parsley plant I pass the Sorrel. "Hmm", It's in the b ack of my mind. The parsley's good and I chop off and mince some of the tops for later. When I take the foil off to put the parsley stems in, the smells are just wonderful. I drool and my stomach rumbles again. I put some stems inside the fish and some on top and cover it again. Right about this time I am quite pleased with how this creation is turning out. I tell Mom how privileged this fish is to be prepared in this way. She gives me a token laugh...she just wants me to get it done (dinner time is getting close). After a while I pull the salmon out thinking it's done. It's not. Not even close. It cooks longer and I pull it out again, quite confident now that it's done. It's not. It is now falling apart all over the place from all the transferring to and from the pan. I tell Mom that the presentation isn't going to be as stunning as I thought or hoped. That's okay though, the straggling pieces give me opportunity to taste it. My stomach rumbles. Meanwhile the peas are warming up in a steamer in the salmon pan. I make yet another comment to Mom, who was working on an elegant carrot dish with ginger and spiced nuts (yes, we're working together on this meal) about how my peas are jealous of her carrots. I cut off three pieces of the salmon and put them in the pan, and then I put the pea steamer on top still trying to heat them up. Dinner is now waiting on me. I did end up slicing some sorrel and putting it around the platter. I put the peas, which still weren't steaming (oh well), in the center. 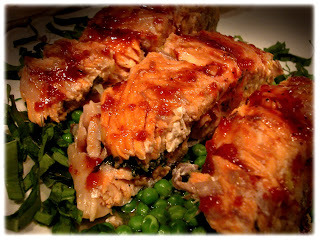 Then the salmon was nestled in the bed of peas with some of the flavorful braising liquid spooned over it. With the back of a spoon I painted some cherry "butter", also in the cherry sampler, over the salmon. And now, the cherry vinaigrette, yes...the final touch, or so I thought (In the rush to get it finished I totally forgot about the parsley leaves I had minced). Everything paired quite well with the salmon, and I could hardly slow down enough to enjoy it. Sweat the first ingredients in a skillet or saute pan with some olive oil for about 8 minutes. Add the liquids and bring to a simmer. Salt the fish and add it to the pan with the parsley and any of the celery leaves from the celery. Cover and maintain a simmer and flip the fish after about 2o minutes (when to flip it depends on how large the fish is). Cook for another twenty minutes or until done. 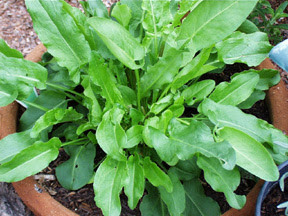 Thinly slice the sorrel. Steam the peas until just heated through. Arrange the sorrel around the edge of the platter, and put the peas in the middle. Cut the salmon into 2 inch pieces using scissors to cut through the bone. Remove any remaining skin that is on the salmon. Place salmon pieces on the peas. Spoon some of the braising liquid over the fish and peas and drizzle some vinaigrette over the fish. *This recipe would work well with Salmon fillets too. Heat the olive oil in a skillet over medium heat. Add the shallots and sauté for about 2 minutes, or until softened. Add the vinegar and boil for 1 minute. Add the dried cherries, salt and pepper, poppy seeds, and heat through for one minute longer. Taste for seasoning.